At Papplewick, we are proud of having a modern family friendly approach to boarding, but one which still gives the boys the best possible preparation for life at their senior schools. The boys see boarding in simple terms – 'fun and friendship' – the fun of the sleepover and the chance to develop deeper friendships with their peers through spending more time together. Our three sets of Houseparents for boys in Year 8, Year 7, and Years 3-6, pride themselves on providing a home from home atmosphere for the boys under their care, and we encourage parents to remain in close touch with their sons and the school – daily contact with home is very much the norm at Papplewick whether by mobile phone or email. All boys board from the Summer term of Year 6 either as weekly or full-time boarders. Many boys also board at a younger age, some on a flexible basis, and day boys are encouraged to board from time to time. Part-time boarding is becoming increasingly popular for younger boys. 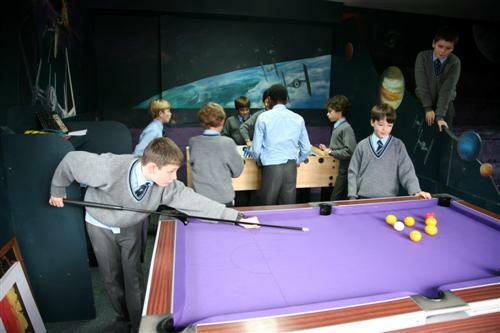 On Saturday evenings and Sundays, an exceptional number of activities and outings are provided for the boys, and during the week, all boarders enjoy a choice of at least ten activities every evening after supper – no wonder the boys see boarding as fun! Once a year, we also hold a themed evening on a Saturday night to which all day boys are invited to enjoy a sleepover at Papplewick. Recent weekend activities have included ' Camp Fires, Camp Games and Camp out', 'Movie and Popcorn Night-in', 'Socials' with a variety of girls' schools, Ten-pin bowling night out, a trip to Gravity Force Ultimate Trampoline Park, 'Master Chef', 'All you can eat Chinese Restaurant Night Out! ', an Ice-Hockey Match, 'Exclusive Use of Woking Leisure Lagoon', a trip to Thorpe Park, and an outing to Portsmouth Historic Dockyard. Day boys arrive at school between 8.00am and 8.25am. Boys in Year 2 go home at 4.30pm on Monday, Tuesday, and Friday, at 3.30pm on Wednesday, and at 4.00pm on Thursday. Boys in Years 3 and 4 go home at 5.15pm on Monday, Tuesday, Thursday, and Friday, at 3.30pm on Wednesday, and at 12.30pm on Saturday. Boys in Years 5 and 6 go home at 6.15pm each weekday and at 12.30pm on Saturday. All boys complete their 'prep' at school under staff supervision before going home.